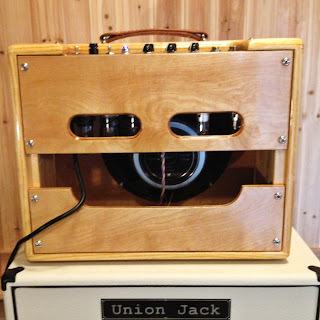 Jim T's Caddy: New Amp Day!! 57 Tweed Deluxe!! New Amp Day!! 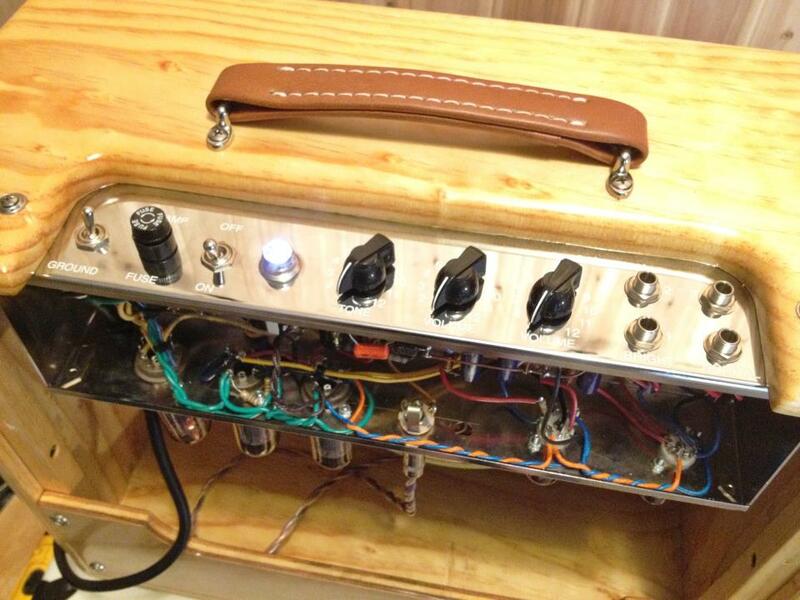 57 Tweed Deluxe!! 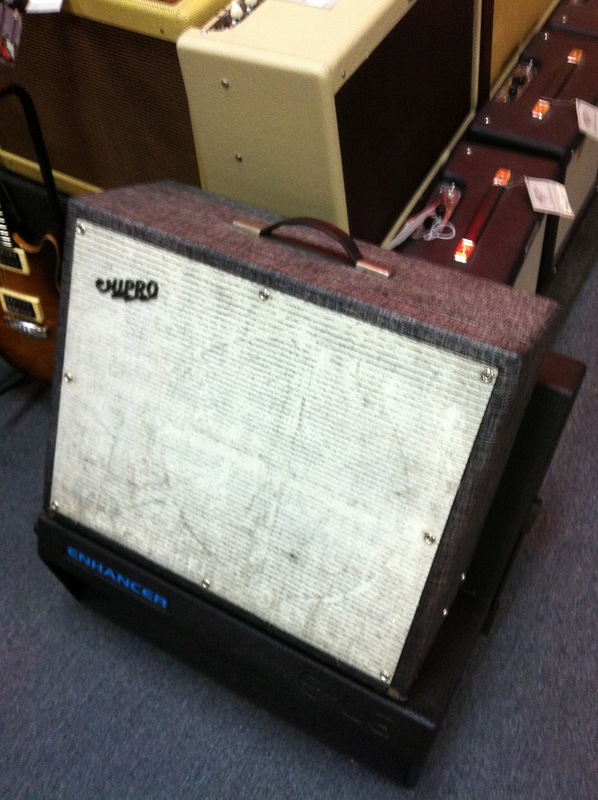 This just in...I GOT A NEW AMP! Usually my problem is guitars but due to a chain of events I have a new amp. 1. I accidentally find a Supro Thunderbolt at Corner Music. It looks so much like the amp I played during the 90s in the band Saint Christopher that I stare at it for so long the owner comes over to see if I'm OK. I get that feeling in my gut like I just ran into an old girlfriend from college. 2. I'm at the BlueBird and Danny Flowers shows up with a 60th Anniversary Woody Pro Junior. Danny could play a barn door and make it sing but the all wood aspect gets me to thinking. 3. 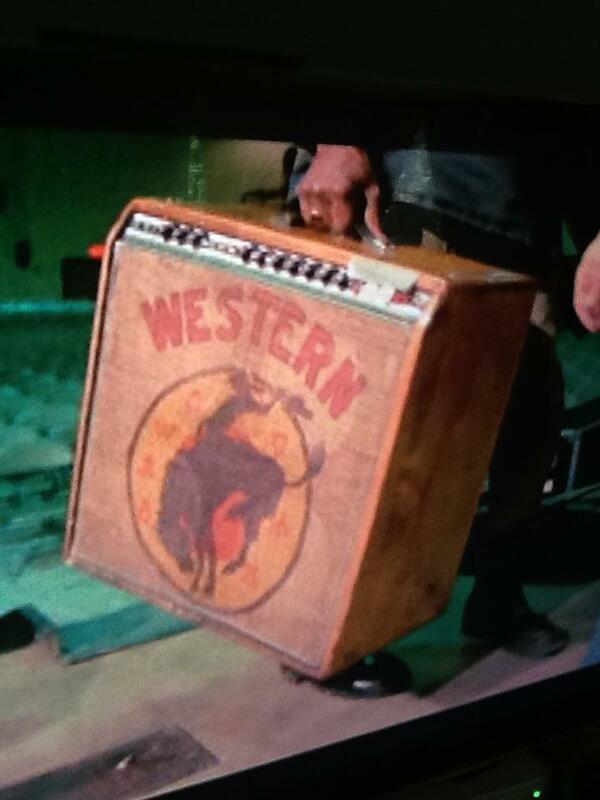 I'm watching Heartworn Highways (find it, buy it, live it) for the 100th time and notice Charlie Daniels amps. They are in natural wood cabs with burlap feed sacks for grill cloth. I search the web for info and come up with nothing. My lust only grows thicker. I take a screen shot. 4. I realize that on my Mustang III amp (get one now) I only play the tweed tones. 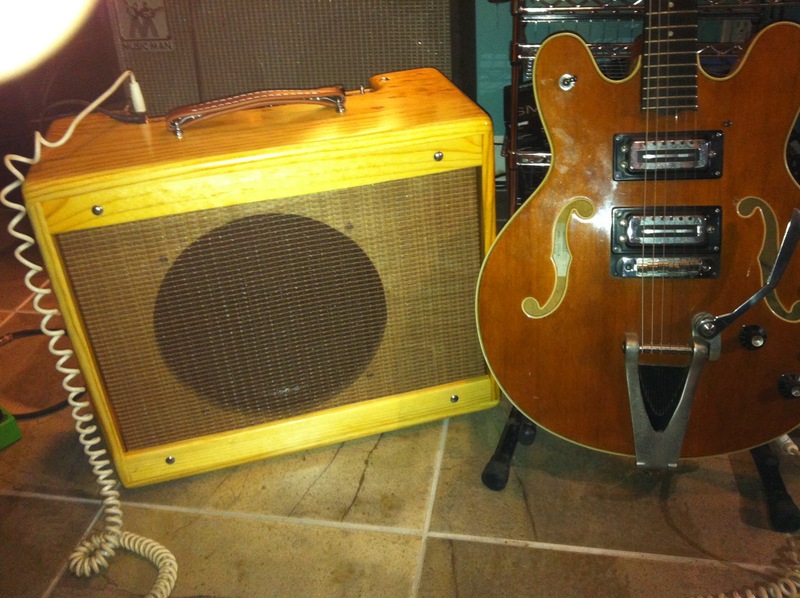 This makes me realize I really need is a tweed amp. 5. I price Fender's 57 Tweed Deluxe and see the price - I look for other options. 6. I realize they make kits and I'm pretty good with a soldering gun. I spend the next few weeks pricing out wood cabs and speakers. 7. 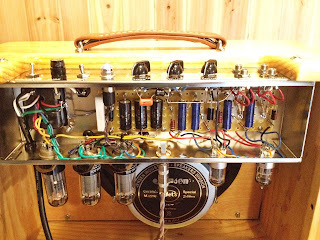 I comment to the owner of Union Jack Amps that the amp he built for himself is exactly how a 57 Tweed Deluxe should look. 8. I sell my digital gear and build up a nice amp pile of money. At this exact moment the owner of Union Jack Amps emails me and says he wants to sell his 57 Tweed....for the exact amount of money I have. Fate!?! YES AND YES!! 9. 5 Days later I'm in Tweed bliss. 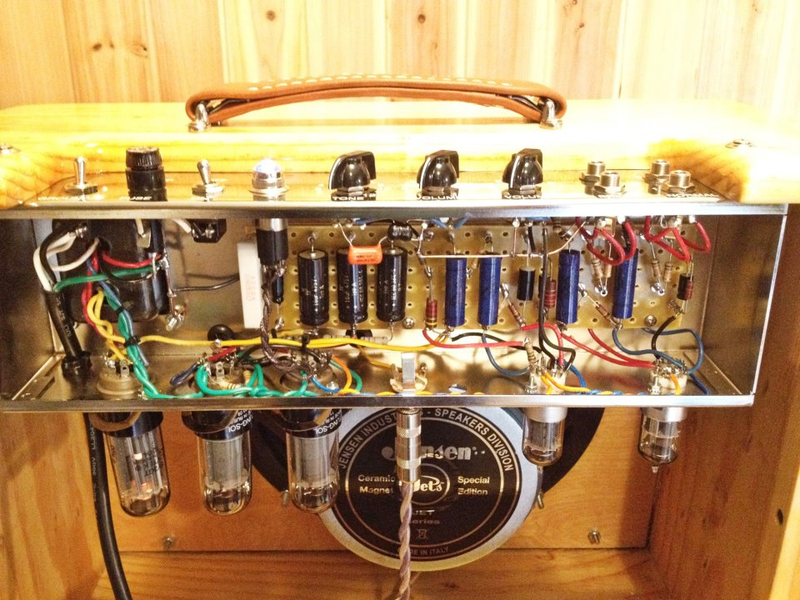 All hand wired 57 Tweed - 5E3 - amp, 15 watts. Mercury Magnetics iron, Sozo blue vintage caps, Tung Sol tubes, hand made pine dovetail cab and a killer Jenson Jet Lightening speaker that keeps the bottom tight. So the circuit is super simple but the way the controls work is very complicated. The tone knob is like a TBX - it either expands or cuts the treble and boosts the bass. Each volume affects the other. You can actually dial in distortion or clean up the tone by adjusting the other volume knob. I'm running an A/B switch to channel 1 and 2. Channel one I can keep pretty clean. Channel 2 I can get a little dirty. Hit A and B and you get volume increase and some big fat greasy blues. PERFECT! It also reacts really reacts different with each of my guitars. My Strat with Texas Specials is amazingly clean and complex - very seductive and beautiful. My 335 copy roars like a damn dragster through this thing! ZZ Top all the damn way. My Tele is very punchy and my 3 P90 Les Paul can just about do all of the things listed above. I'm not even going to pretend I have a good working knowledge of this amp yet but I am in awe. How often does something sound as good as you think it will? And how often does it go beyond that?